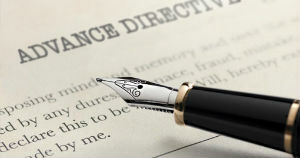 An advance directive is a legal document that allows you to give instructions for a broad range of health care decisions and appoint an agent to make those decisions for you if you become unable or unwilling to do so yourself. It is any written communication from you, properly signed and witnessed, that speaks about your future wishes and preferences for treatment. Because advance directives express your values, they provide the best possible guidance to those who will make decisions about your care when needed. Completing an advance directive also allows you to designate a health care agent, a person of your choosing who can make decisions for you in the event that you are no longer able to speak for yourself. You have the right to give instructions about what types of health care you want or do not want. You also have the right to name someone else to make health care decisions for you when you are unable to make them yourself. You may do either of these by telling your family or your doctor, but it is generally better for you and your family if you write down your wishes. You may use this form in its entirety or you may use any part of it. For example, if you simply want to choose an agent in Part One, you may do so and go directly to Part Seven to sign this in the presence of appropriate witnesses. You are also free to use a different form as long as it is properly signed and witnessed. You should give copies of the completed form to your agent and alternate agent, to your physician(s), your family and to any health care facility where you reside or at which you are likely to receive care. You should keep a list of those who have copies in case you revoke or revise the document in the future. You have the right to revoke all or part of this advance directive for health care or replace this form at any time. If you do revoke it, all old copies should be destroyed.